Is that an ocarina? Finders keepers! 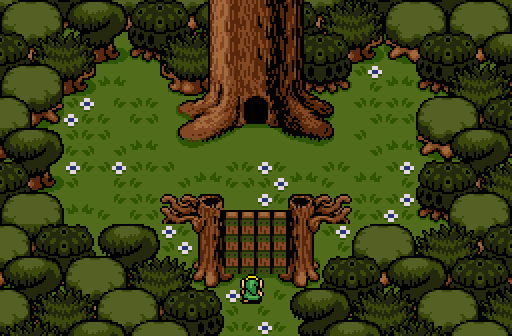 A Link to the Treehouse. I've decided to go simple this time... enjoy! My apologies on being late with this weeks SotW. Peteandwally's just confuses me as to what is going on. 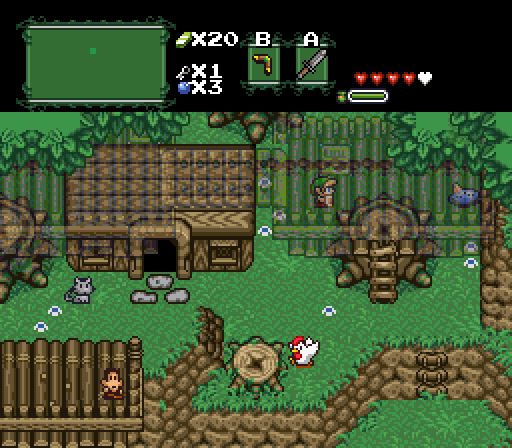 Also some tile errors with the base of the mountains near the ladder. The perspective with the southern LttP perspective mountains next to the GB perspective mountains on the right just look odd. And to top of it off, the ground is mostly empty and the palette is generic at best. Goriya's is... okay, but all that variety that should be on the ground is with the trees instead. And the tree choices are rather odd and don't explain what kind of environment is it meant to be (forest, swamp, snow top trees). Demonlink's is simple, just like he said. It's nothing too amazing. I would have voted here regardless for neat screen design... but this shot just peeves me. Grass edges looking like they're floating above the water with no shadow to a blue tree with brown highlights. It's a very nice screen with average execution. I'm not a fan of these shots, sorry. Blue tree(demonlink) got my vote! Goriya's is... okay, but all that variety that should be on the ground is with the trees instead. I said it was a rule...? When and where did I say that? Because I reread and I can't where I stated it. What I said was an opinion/preference to my knowledge. I just thought the ground was bland and that Goriya should have put more thought into the ground instead of the trees (since the variety looks odd to me). Easy now. Edited by Shane, 11 September 2013 - 02:10 AM. I eventually went with Demonlink's because I just like it's simpleness and truly there is nothing for me to dislike about it. Peteandwally's screenshot is slightly confusing to me; why is a layer transparent? Can you go on it and then it solidifies or something? (You see, hard to tell what's going on). Goriya's screenshot is very decent as well with nice variety, but I can say there could be a few more details on the grass. But solid screen anyways! I voted for Goriya because it had no subscreen. Oh and the rest of the shot was pretty good too. I voted for peteandwally for creative use of transparent layers. Goriya's screen is the only one with a good palette and peteandwally's screen is creative but lacks ground detail. In the end I voted for demonlink. My vote goes to peteandwally. The screen has a refreshing design. 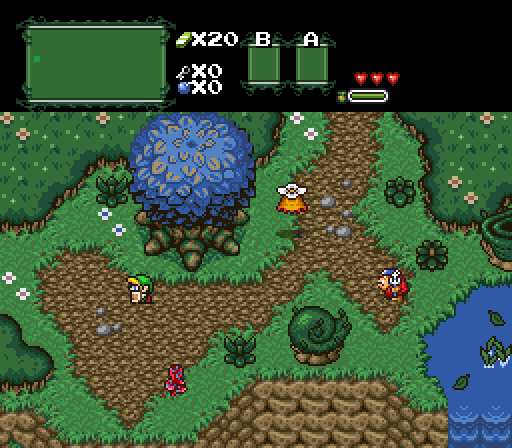 In comparison, Goriya's has nice symmetry and tree variety but still feels plain, and Demonlink's has a blue tree with some ugly grays toward the top that distract from an otherwise pretty and adequately-detailed screen. 40 members have cast votes!